Review of KOHM KP-700 Toenail Clippers - Will it Get the Job Done? Thick and ingrown toenails might become a real problem for some people and having a toenail clipper that allows you to get rid of this problem is always not easy to find. With problems such as fungus and diabetes becoming more and more apparent, the right toenail clippers can definitely be a real lifesaver if you are looking to trim your nails. The Kohm KP-700 Toenail Clippers are the ideal toenail clippers that have been designed to make all this possible and to rid you of the problem and struggle of not being able to trim your nails. Using this clipper proved to be quite easy and after finding one, I set out to see how strong it is and which features it offers that you find in any other similar clipper. 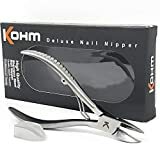 Designed slightly better than your standard nail clipper, the Kohm KP-700 Toenail Clippers are made of durable stainless steel and they are much larger as well. The additional handles will give you more power for thicker toenails and they can also allow you reach those ingrown toenails that might cause some additional pain as well. Will These Clippers Work For Ingrown Toenails? Having ingrown toenails can be a real problem and they are painful as well. If left untreated, the problem will persist and can be even more painful in the long run. Testing these toenail clippers proved to be something new and with the shaper blades and a longer reach, they will easily fit in between the sides next to the skin and this will allow you to rid your self of ingrown toenails. While this process might take some getting used to eventually, the clippers will be much easier to use and they will make trimming simple. By constantly using these clippers and keeping the ingrown toenails under control, you could rid yourself of the painful experience associated with ingrown toenails and it will be much easier to keep them under control. Are these clippers easy to use? Most common nail clipper will feature shorter handles, but the Kohm KP-700 Toenail Clippers will give you the extra long handle and this handle will work wonders when it comes to ridding you of tougher nails. Fungus tends to be one of the main reasons why nails get harder and thicker and this is also due to not using the right nail polish if you are a woman. The added leverage will allow you to comfortably trim your thicker nails and will allow you to easily get rid of the problem. Over time you will get used to this clipper, but at first, I have seen many people wary of injuring themselves due to the sharper points. This toenail clipper should definitely be used with the utmost of care. One of the main differences between this toenail clipper and the regular once you find on the market is the design and the construction. Made from top quality materials, this toenail clipper tends to be much more durable. The durability means that they will last you longer and they will not suddenly break apart from strenuous use. The grip is another major factor and when working with such sharp objects, it can be dangerous and by slipping once, you could easily do a lot of harm to yourself. With a longer handle, as we have mentioned before, and the addition of small cuts, the handle offers you optimal grip for a comfortable trimming experience. The clipper also comes with an additional safety cover and this will be perfect if you have children who might feel tempted to use them. The plastic safety cover easily slips on but might be daunting to take off and this is also the perfect design for keeping them in your travel bag. Many women today feel like keeping a toenail clipper on hand for when the need arises to trim and wear some open shoes. Are these clippers easy to clean? Once again, we need to look at the overall design and with a small pocket that is not present, you need not worry about the nails being caught up in the clippers themselves. The nails should fly off, but this could lead to another problem of having everything scattered all over the place and make some work for you when you are done. Cleaning the clippers after use is not that daunting and they can simply wiped before storing them again. From time to time, it is recommended that you clean them with some sterile water and this will remove any bacteria that could lead to long-term problems and infections in the nail areas. It is also worth mentioning that the clipper should be left to dry adequately after they have been cleaned. While they are constructed from extremely durable materials, you will also have the problem of rust that might build up or even the stench of water. I would recommend leaving them in a clean environment to dry out naturally before putting them back into the covering sleeve. Do These Clippers Work As Described? With many people not believing in marketing and thinking that things are often time marketed as more than they could do, I have found these clippers to be extremely effective at getting the job done. A user manual is also included in the package and if you follow this to the letter, you will not have any problems with toenail problems. For me and those I know who have used these clippers, they seem to work exactly as they are described and should even allow you to get the job done faster. Another thing that people should know is that once you become accustomed to using these clippers, they can be used for trimming your fingernails as well. With such versatility, these clippers are definitely worth the price. On final thoughts, these clippers are rather effective at doing the job and for the price; they can be seen as a real bargain and also great value for your money. The clippers might not be the most comfortable to use at first, but once you do get the hang of them, they are simplified and you will fall in love with them when it comes to trimming your toenails. I would definitely recommend them to all the people I know, but they will work best for those with thick toenails and suffering from a fungus that has been left untreated for a while. Quality is definitely ensured and if you want the best value for your money, this is certainly one of the ways to ensure that you get it for taking care of your self. We would like to thank you for reading this article and we would also like to encourage you to share some of your thoughts on these clippers. Please let us know in the comment section if you have any experience in using them and whether you would recommend them.